Transform your Lemur (or iPad with the Lemur app) into a real-time virtual control surface for Kyma and other MotorMix supporting applications. 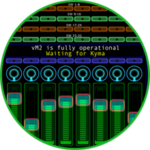 vM2 supports "Midi over OSC" technology, allowing vM2 to communicate with Kyma on Paca(rana) setups without the use of physical interfaces. It also supports the use of multiple Pacarana(s) over the same network. vM2 includes 2 templates: one that is optimized for Kyma, and another that creates an amazingly similar control experience to the MotorMix hardware device. For Kyma users, why use vM2 and the Lemur app running on your iPad instead of one of the other iOS alternatives? The answer is flexibility and customization. vM2 is a translator (or bridge) between Lemur controls and the MotorMix language that Kyma automatically supports with every Kyma sound. vM2's two Lemur templates provide the user interface. And since they are standard Lemur template files, you can modify them or incorporate them with a more personalized Lemur template, using the Lemur layout application. But why do you even need vM2 when Kyma understand's OSC and the Lemur excels at OSC based controllers? The answer is that vM2 is supported by Kyma's automatic VCS assignment system and general OSC based controllers, like the Lemur, are not. vM2's compatibility with Kyma's built-in VCS support means that each and every Kyma sound is automatically mapped to vM2's faders, rotaries, and switches. Without vM2 your Lemur creations must be "manually assigned" to each Kyma sound you wish to control, or the sounds themselves modified to expect the OSC messages. vM2 handles this for you with complete bidirectional control. Note that this does not mean your Lemur will automatically reconfigure itself to mimic the VCS's layout. That bit of magic is something you currently need Kyma Control to achieve. What vM2 does, as its MotorMix predecessor also did, is provide a predetermined assignment between VCS controls and vM2 controls that is both consistent and repeatable across Kyma sounds. A number of our existing vM2 customers have already created customized Lemur templates by integrating the vM2 template as one page in a larger Lemur template (Lemur templates can consist of a number of "pages" that you can readily navigate between). Other customers have modified the vM2 template itself to better fit their needs. So if the new Lemur iOS app sounds like something you would like to add to your Kyma bag of tricks, also consider vM2, your Lemur gateway to Kyma's VCS! * Easily installed by double-clicking the vM2 icon. Visit its preference pane in Systems Preferences at least once, perform some initial setup procedures and it's ready to go! * Communicates directly with Kyma Paca(rana) using "MIDI over OSC" without the need for physical interfaces or cables.Supports attachment to actual MIDI ports, as required with Kyma Capybara, or one of the "virtual MIDI ports" provided by OSX's IAC MIDI driver for other applications such as Apple's Logic Pro. * vM2 is a type of translator: one side "talks" to the Lemur in its native tongue using OSC commands over the network, while the other side communicates with the application over either a physical or virtual MIDI port using "MotorMix-speak". All of this happens behind the scenes without your direct involvement. vM2 can be purchased from the Delora website, www.delora.com/sales/ for $32.95 USD. * To be used with Kyma Capybara (or Paca(rana) without the MIDI-Over-OSC feature), vM2 requires a Firewire, USB or other physical MIDI interface connecting the Kyma hardware to a Mac. Note: vM2 does not currently support DigiDesign's Pro Tools software.